It’s not extremely often that a book pulls me in completely before I even finish the sample, let alone the first few pages. Bam…I was hooked. Not because of anything crazy going on, but Maas knows how to write a character. Her portrayal of the protagonist begins with the first words, and I immediately felt something. Like? Dislike? I wasn’t sure at that point. But I knew that I wanted to like her, and I wanted her to win. Despite her somewhat acerbic attitude, you can see the intricate layers that make up the complexity that is Celaena Sardothien. Sure, she’s flawed, but in oddly likable ways and for surprisingly understandable reasons (for the most part). 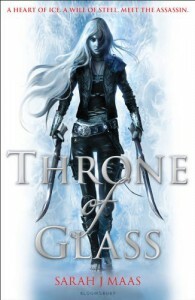 I will just say that the Throne of Glass series is pretty phenomenal. At first, I thought Maas was ripping off a good bit from The Hunger Games until I read that she started writing it a decade ago. It’s an interesting twist on the Cinderella story, and a fantastic read for anyone who loved The Hunger Games. It was a refreshing read with a well thought out plot and substantial character development. I look forward to delving more into this fantasy realm with the next in the series, Throne of Midnight.